The Arctic Council (AC) is frequently referred to as the most important international forum in the Arctic. The AC has produced substantial knowledge on Arctic issues, and informed the debate on challenges and opportunities in the region, ranging from research on climate change, introduction of shipping guidelines and emphasizing regional health issues. It is a significant player in the region as a producer of knowledge, presenter of guidelines and recommendations, Arctic environment assessment and monitoring body, and arena for the drafting of binding international agreements. 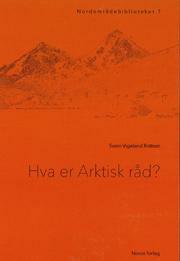 In this book I look closer at AC's role in Arctic Governance.